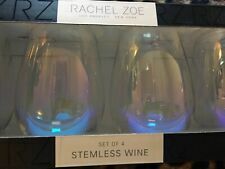 RACHEL ZOE Stemless Iridescent Wine Glasses Set Of 4. Condition is New. Shipped with USPS Priority Mail. 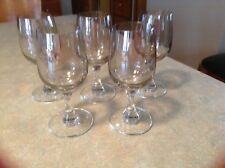 vintage iridescent wine glasses, Set of Five (5). Set of five iridescent stemmed small 4 oz volume wine glasses. The glasses have a tannish, rainbow reflection in light. They measure 5" X 2.25"wide. They are previously owned, in excellent condition with no chips, cracks or scratches. Lot of 6 iridescent glasses absolute perfect condition. Holds about 4 oz of liguid or 1/2 cup. No defects. These are New never used and in excellent condition. Luster Clear Glassware has an iridescent sheen that makes every piece stand out. The refraction makes it look like a Soap Bubble. Iridescent Clear Finish. HOLDS 12 OZ. Widespread Panic Mikey Houser Wine Iridescent Wine Glasses. Etched by me, for you! Perfect Gift for any widespread panic fan! Also can be used for cocktails or beer! 600ml. Set of 4 Iridescent/Opalescent Glasses. LOT OF 2 AMETHYST IRIDESCENT TALL WINE GLASSES CLEAR BALL STEM 10 1/2"
UP FOR SALE IS A PAIR OF VERY UNIQUE WINE GLASSES. THEY JUST NEED A GOOD CLEANING. I DO NOT KNOW WHO THE MAKER IS. THEY ARE SO TALL AND ARE JUST GORGEOUS. Beautiful Vintage PEARL IRIDESCENT Opalescent Wine GLASSES SET OF 4. Condition is Pre-owned. Shipped with USPS Priority Shipping. CLEAR with RED/GOLD RIM & IRIDESCENT TEAL decorated stems & base. GLASS STEM WINE GLASSES. Handmade in ITALY. SET OF 4 ( 8.5" high). Iridescent Colors. Wine Glasses. Green, Blue, Yellow. LOT OF 2 BLUE IRIDESCENT TALL WINE GLASSES CLEAR BALL STEM 10 1/2"
UP FOR SALE IS A PAIR OF VERY UNIQUE WINE GLASSES. THEY HAVE A BLUE IRIDESCENT BOWL WITH A STEM THAT HAS A CLEAR BALL. THEY JUST NEED A GOOD CLEANING. I DO NOT KNOW WHO THE MAKER IS. THEY ARE SO TALL AND ARE JUST GORGEOUS. LOT OF 6 AMETHYST IRIDESCENT BALLOON WINE GLASSES CLEAR STEM 8 3/4"
Condition is Used. These are lovely hand blown wine glasses. They are 8 3/4” high and 3” across the mouth. These glasses are just gorgeous! There are 2 blue, 2 green, 2 yellow - orange and 1 pink glass. The stems fit your hand nicely. IRIDESCENT 3 WINE GLASSES. Shipped with USPS Priority Mail. EXCELLENT CONDITION. Set of 4 Iridescent Etched Design w/ Gold Trim Wine Glasses 8 1/4" Tall EXCL!!! Set of 4 beautiful wine glasses. Etched design with two gold bands and see through iridescent color from bottom to 2/3 of way up. All are in excellent condition. I included a picture of a normal size wine glass that is 8 1/8” tall so you can reference size. These are exceptional quality and gorgeous. Tiny bubble here and there. The pic of filled glass is with 4 oz of water. TMD Holdings Stemless Flute Set. Iridescent with Gold Dotted Glasses. Shot Glasses Whiskey Glasses Mulled Wine Glasses Iridescent Blue Cocktail Glass in good pre owned condition. Fit perfectly into your hand, color changes from blues to purples-nice set. If problem should ever arise I will do my very best to make sure you are satisfied. Whether as an addition to your collection or a special evening these beautiful glassses will provide lasting pleasure.